House Minority Leader Nancy Pelosi sat down with CNN and gave an interview that seemingly raised the hopes of the Democratic Party by stating that they need some fresh “new blood” to come in and reinvigorate the stale and dying left-wing. The insinuation here was that perhaps she was going to be retiring soon. Then she destroyed those hopes as quickly as she established them by announcing she wasn’t going anywhere anytime soon. 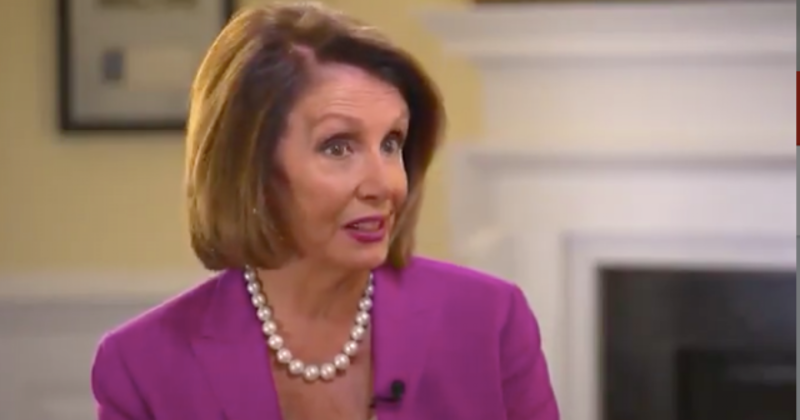 In an interview that aired on Monday night with CNN’s Christiane Amanpour, Pelosi talked about the future of the Democratic Party. “I do agree, it’s time for new blood and we should move on. And if Hillary Clinton had won, and the Affordable Care Act was protected, I feel very proprietary about that, I was happy to go my way,” said Pelosi. The interview comes as a growing number of Democrats have expressed their dissatisfaction with Pelosi’s leadership. Many in the party were hoping that Rep. Joe Crowley (D-NY) would challenge Pelosi for her leadership position until he was upset by democratic socialist Alexandria Ocasio-Cortez — whom DNC chairman Tom Perez has deemed “the future” of the Democratic Party. Here we thought we might finally be rid of Pelosi and her whacky antics and incoherent speeches. Oh well. It’s hilarious that Pelosi states how badly the Democratic Party needs fresh blood, all the while she refuses to get the heck out of the way so that new blood can have a path to enter the political arena. We constantly hear Democrats talk about how they are the party for young folk, for future generations, for diversity, ect. Meanwhile, the vast majority of them are rich, white, old men.